In a recent post, I talked about all the great, life-changing reasons you should have a creative passion project. Since sharing the post, I’ve even heard back from people who shared their own passion project ideas with me, and it’s been nothing short of amazing. I really want to start a passion project! But I don’t know what. While most of us already know what sort of side projects we want to have, I realized that’s not the case for everyone. 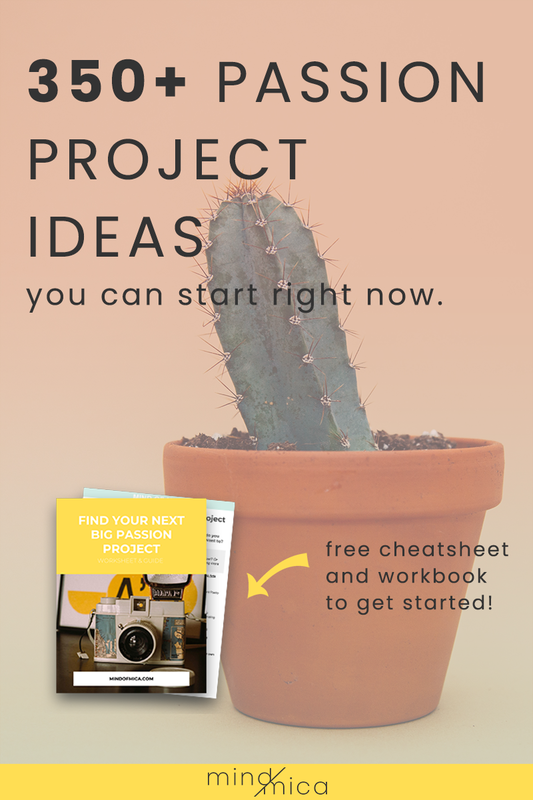 So whether you’re someone who doesn’t know what kind of passion project they want to start or even if you’re someone with only an inkling of an idea, here’s a mix-and-match list of cool passion project ideas just for you. Here I name some of the most popular ways people have shared or started their own passion projects. You can even call them “platforms” or “mediums,” if you prefer. In the section after this, you’ll find an endless supply of topics or niches in case you need some aha! moment to start. And later, we’ll see how these platforms and topics can mesh together into your brand new, super personal, go-start-one-right-now passion project. At the top of the passion project ideas list is starting a blog. I’m willing to bet my own blog that you know someone (other than me) that’s started a blog of their own. Be it on Blogspot/Blogger, WordPress, Wix, or Squarespace, there’s a platform that hosts thousands of people’s personal blogs, portfolios, and websites. Hint: you don’t have to be a writer to be a blogger, so you can start a blog even if you hate writing. Open a YouTube or Vimeo Channel. Let’s be real: at some point in all our lives, we all wanted to be YouTubers and be part of the cool community that started the YouTube we knew back in 2009. But I also find that many of my video-savvy storytelling friends go on Vimeo, especially to upload their more artistic works, like short films or animations. You won’t believe how much I actually love podcasts (I actually want to start one just because I can never stop talking about certain things). Having a podcast is almost just like a YouTube channel, except all the focus is on sound. Imagine it as your own radio show. Put Up an Online or Physical Store. Maybe you want to start a Facebook page that curates and creates content every so often (you don’t always need to sell a product or service to be an online brand). And Facebook groups make a great community-building platform, and I’ve joined a handful of groups where I meet a lot of likeminded people. Your passion project can even holding a series of workshops about things you’re good at. After all, there’s always going to be someone who’s willing to learn new skills – skills you already know. And these don’t always have to be crafty or artsy. I sometimes hold workshops for college student leaders on organization and project management. Okay, your workshops honestly don’t even need to be in-person anymore because there’s technology for that. You can start an online course right from your Google Account (yes, there’s Google Classrooms, ICYMI) and companies like Thinkific, Teachable, and Udemy have built websites to host your courses. You can even write a book as a passion project. If you don’t want to spend too much on physical copies, you can always turn your writing into an eBook and publish it online instead. Start a Gallery or Online Portfolio. One of my friends Max recently started an Instagram account for her super-cute drawings. You can even share your works in a real-life gallery. It doesn’t seem fair to make a passion project ideas list without including this. Whether a new product is something you want to create to solve a problem that you have or if it’s something you want to eventually sell, this is definitely one of the more interesting creative passion project ideas out there. Admittedly, there are infinite possibilities for this section, and they all depend on things you’re interested in. I list down some of the most popular umbrella topics as well as subcategories in each one. I do try to be as exhaustive as possible, and you’re definitely not limited to picking just one of these topics! After all, these are just passion project ideas to jump off from, and your passion project is yours, so do whatever you like with them. This is a common topic a lot of people start especially a blog on. Some people even share this topic through a micro-blog on Instagram. What’s the city you live in like and how do you live your life inside it? This topic can even give birth to even more passion project ideas. Restaurant reviews, recipes, or just plain pictures of good food. Food for people, for dogs, for cats – go wild. Places to go, sights to see… Where to stay, what to look for… Any secret hacks for backpackers or people on a budget? Workouts, meal plans, diet tips, weight loss tips… If this is your thing, there’s a whole bunch of people who’d love to hear what you have to say. Beauty junkies, it’s your time to shine. Do you have holy grail product reviews for fellow beauty fans? Love talking about more wallet-friendly products? Or maybe you’re more into organic or natural alternatives? Your thing might be all your different OOTDs. Or you could be more of the guilt-free fashionista that has a message about sustainable fashion. You could be super good at doing different hairstyles and want to share how-tos for the perpetually lost (like me). My sister and I had this very short phase where we watched nothing but home improvement shows on TV. You might have ideas on how to make a room super pretty, or super minimalist, or even just super different and personal. Lots of people will look for DIY alternatives to most everyday stuff because they’re either more affordable than buying from a store or because they’re into doing things with their hands. Maybe you know DIY tips and tricks for clothes, accessories, or room/home decor? There’s no shortage for the kind of do-it-yourself tutorials you can share. While I’m not a parent (yet), I’ve seen – and met! – a ton of mommy bloggers. Parenting may seem like an overused niche, but really, there’s always going to be someone who needs your cannot-live-without parenting hacks. One of my favorite movements that have come to light recently is the mental health awareness movement. If you’re a advocate for self-care or bettering oneself, by all means, make a passion project all about it. I don’t think this topic is only reserved for career coaches. You might have tips and tricks for people about to graduate from college. Or you might know how to help people get more from their work. Or maybe you’re even all about work-life balance. Money management, savings goals, budgeting – there are people out there that need your sage wisdom. This deserves to be its own niche because of literally how many startups we’ve seen emerging in just a few years. You might know a lot about starting a small business, or you might have freelance career that you want to help other people reach too. From products to reviews to how-tos – even to answering all these different tech-related questions (I can’t count the number of times I Googled issues I had with my computer) – there’s a whole bunch of things you can dive right into. I mean, there are thousands of gadgets and gizmos all over the planet, and thousands more ways to do a tech-related passion project. My older brother, my boyfriend, and a lot of their friends are all gamers, so honestly, I don’t see why you can’t have a passion project related to gaming. One of my friends even has a YouTube channel with walkthroughs on some popular video games that he’s monetized in the past. For most people, a creative passion project might automatically mean art-related projects. And because most of these things are pretty straightforward, I’ll be jotting down a quick list of different mediums just for your inspiration. “Do I already have to be an experienced artist for these?” you ask. My answer: not at all! You can always start an art-related passion project without any experience. After all, you do need to start somewhere. You might have a knack or interest in crochet, knitting, or quilting. And those would make awesome (and pretty!) passion projects in themselves. Think origami or paper mâché! As someone who loves DIY, I can tell you there’s no shortage here. There are DIY bags, plushies, leather goods, soap, candles – too, too many to name! Start recording your travels or family life or even lookbooks! Some people would refer to it as bullet journaling, but I find that creative journaling is a more appropriate term for having those gorgeous hand-drawn layouts and lists inspired by the original bullet journal. And this doesn’t only mean the plastic-bead jewelry we used to make when we were kids, either. Perfect for anyone who’s not afraid of getting their hands a little dirty. Handmade pottery is also super pretty to have in your home! Okay, maybe I got the idea for this off a girl scouts activity, but carving stuff out of wood seems pretty cool if you’re into that kind of thing. My guy friends are obsessed with model kits from Japan. But this isn’t only about gunpla – there are also model kits for ships, buildings, and lots more. You might stand for something real important to you, like living like a minimalist or being kind to the environment. If so, there’s all the more reason to have a passion project around it – so you can share in the advocacy. So you’ve got all these ways to start passion projects and you’ve got all these topics or niches for passion project ideas. Now the only thing you have to do now is to put them together – and voila! You’ve got yourself a passion project. Here are a few example of ways you can mix and match your options, plus how these options can be narrowed down into something more bite-sized (meaning, less overwhelming!). Write an eBook + DIY room decorations that busy people can do in an hour or less. You can even publish the book and make money on the side. Start a Blog + Tech: affordable alternatives for everyday electronics for people on a budget. You help other people save on gadgets and appliances but still letting them a bang for their buck. You might even partner with actual brands in the future. Hold a Workshop + Photography for aspiring food bloggers. You could teach people how to take better photos for their blogs and articles if they want to get more clicks and views on their site. Open a YouTube Channel + Advocacy on how to live with less waste even if you live in the big city. You’ll help people be more responsible by realizing there are simple everyday ways anyone can adopt to reduce plastic consumption or paper and food waste. And these are only a handful of examples among all the countless possibilities! If you don’t have a passion project already, I challenge you to use this mix-and-match list to start your own. Important: Start a passion project that you want to do, not what think others would find cool. If it doesn’t make you more passionate, you won’t commit! How can I use this guide to come up with my passion project? To make the mix-and-match process easier for you, I came up with a worksheet version of this passion project ideas guide! You can get it here. Once you’ve downloaded it, be sure to print it out and really devote 5 minutes – just five minutes! – of your time to accomplishing it, so that you can find the perfect passion project to give you more meaning and purpose every day. Ready to go big on your passion project? Grab your copy of The Goal-Getter Playbook today, so you ideate, plan, and launch that passion project you’ve always wanted. What passion project have you always wanted to start and why haven’t you started it yet?